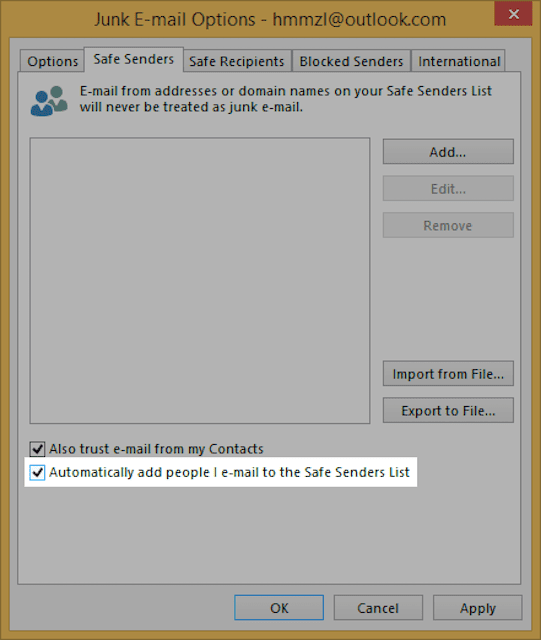 Automatically Add People You Email to the Safe Senders List (Outlook 2013). Microsoft, Inc.
Outlook has reasonably good spam filtering. Like much of the world, that junk mail filter is a little shy of being perfect, and it can not only leave spam in your inbox—it can also mistakenly move good mail to the Junk E-mail folder. To make sure less of these desired emails are lost in the spam folder, Outlook offers a Safe Senders list. Messages from these senders are never treated as junk, and the list is also used to automatically download remote images while the default is not to do that for privacy reasons. While it is easy to add senders or domains to the Safe Senders list in Outlook by hand, that is also a task easily forgotten. Fortunately, Outlook has a nice feature that helps you build your list of known contacts: it can automatically add everybody you send an email to the list. Make sure the HOME tab on the ribbon is active and visible. Click Junk in the Delete section. Select Junk E-mail Options… from the menu that appears. Select Actions | Junk E-mail | Junk E-mail Options… from the menu. Make sure Automatically add people I e-mail to the Safe Senders List is checked.